Elsewhere on our website, you’ll find many examples of our work and the various landscape design-build services we offer for homes in the Southern Georgian Bay area, including Collingwood, Meaford, Thornbury, the Beaver Valley, and Town of the Blue Mountains. But there’s a lot more we do. With that in mind, here’s a more extensive listing of the services, products and installations we can provide for your landscaping projects. But if you don’t see it here, please ask us. Steel vinyl construction. 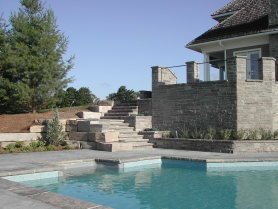 Wide choice of shapes, sizes and liners; accessories can include cantilevered stone coping, waterfalls and diving rocks. Gunite construction (concrete) – Limitless choice of shapes, sizes, tile borders and marbolite finish colours. Accessories can include natural stone coping with vanishing edge. Installations can include waterfalls, streams, falls and ponds or entrance feature.